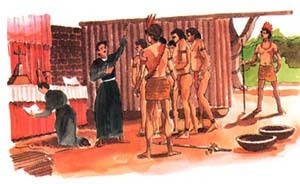 Here you find the history of Tocantins as it started 3 centuries ago when missionaries from the north and gold seekers from the south arrived and settled. In the south of Tocantins you still find remainings of that period. But did Tocantins history start then? From 1995 to 2000 archeologist from the Museu de Arqueologia da Universidade de São Paulo (USP) have been working hard because the new Lajeado lake could destroy important historical remainings along the river Tocantins. They found 150 locations with remainings of the pre-colonial era. During the past 10.000 years indians lived a (semi) nomadic life. They were familiar with agriculture (mandioca, maize, tobacco, cotton). They made rock-paintings with minerals and plant-resins, rock sculptures and ceramic vases. On one location it is expected that the river Tocantins could be crossed by feet during the dry season and a village was build there. Brazil's colonization process benefited mostly the seacoast, due to the difficult transport and the countryside's unfavorable relief. During the Colonial Era, the trails opened from the seacoast toward the interior were meant more to take over territory than to explore the country's resources. This would come later, as a way of taking hold of the land; first in a casual way, and, as the prospect of the Portuguese Empire taking part in the exploration of India through the "Companhia das Indias Orientais" (East India Company) in a more organized manner. This interdependence of trade and exploration, especially of gold, precious stones and hardwood stimulated trading between the incipient cities in the countryside and the commerce centers at seacoast. 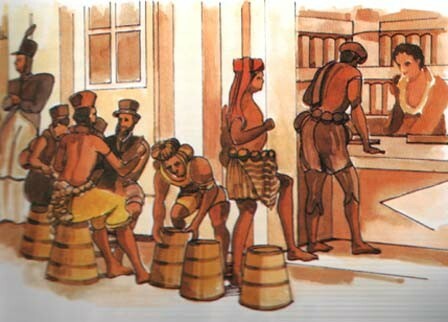 Holding huge botanical and mineral resources, Brazil was compelled by the Portuguese Empire to set apart some areas just to take advantage of its wealth, inhibiting new ventures. However, with the Declaration of Independence, Brazil became an Empire, marking the beginning of a Gold Age, when the Royal Goverment, among other things, granted the construction of railways to free enterprise, what would permit to begin a process of development. Old Goiás earliest exploration was carried out in two fronts; to the South, the "Bandeirantes"(explorers from São Paulo State who followed river paths) were the first settlers, with the famous Bartolomeu Bueno "Anhanguera" (Old Devil in Indian language) standing out; to the North, missionaries guided by Friar Cristóvão de Lisboa along the Tocantins Rivercourse, founded a religious Mission in 1625. 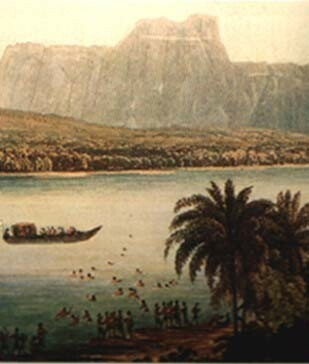 But, undoubtedly, the Bandeirantes were the greatest explorers, occupying most of Goiás during the 18th Century. A 1722 expedition from São Paulo, leaded by Anhanguera's son, Bartolomeu Bueno da Silva, João Leite Ortiz and Domingos Rodrigues do Prado discovered promising mineral deposits in the State in 1725. From there on, several expeditions followed, reaching where is now Tocantins State. About 1730, rich gold mother lodes were found in the region between Bahia State bushland and the Tocantins Mountain Range, around the cities of São Luiz, Natividade, São Félix, Portal, Porto Nacional, Arraias, Cavalcante and Pilar. By that time, there was great turmoil at the mines, with the Paulistas (people from São Paulo) and the Portuguese fighting the Maranhão and Grã Pará "Capitanias" (Colonial Domains) for the mines monopoly. Difficult access to the State's North led to an unequal wealth distribution, benefiting the South up only to mid Tocantins River; but the population density was improving in the North with the increase of regional economic activities, while mining was declining in significance in the Southeast. On March 18th 1809, the separatist forces manifestations against the forcibly collection of heavy taxes on mining forced the Crown to split the North of Goiás State from the Auditor Office at Vila Boa, creating the São João das duas Barras Province. The subsequent isolation caused the Crown to split the North of Goiás State from the Auditor Office at Vila Boa, creating the São João das duas Barras Province. The isolation caused the North to further alienate from the South, establishing commercial and political links with the Maranhão and Pará Provinces. These were the seeds of secessionism. On September 15th 1821, The Province's Auditor General, Provincial Magistrate Joaquim Teotônio Segurado rebelled against the Portuguese Crown, proclaiming an autonomous government, first in Cavalcante and later in Natividade and São João de Palma (now Paranã). In 1873 the Viscount of Taunay introduced a bill for the creation of the Boa Vista do Tocantins Province, as an option to a project to annex the Northern region of Goiás Province to Pará's, presented by Representative João Cardoso de Menezes e Souza, but the Viscount's proposition didn't succeed. In this Century, in 1956, a Porto Nacional District Judge wrote a Declaration to the Nation, signed by numerous Northerners, marking the start of a campaign for the creation of a new State, split from Goiás, which reverberated in the State House of Representatives, with the introduction of a project for the creation of Tocantins State, with the number 1 Constitutional Act Amendment. 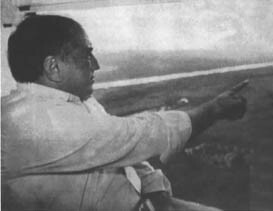 In 1972, Representative Siqueira Campos, as head of the Federal Congress' Amazon Commission, introduced a Bill for the partition of the Legal Amazon, with a provision for the establishment of Tocantins State. Other projects, bills and amendments were also presented, of which two were approved, both by the House and Senate. But twice President José Sarney overturned the Tocantinenses (people from Tocantins) dream, on the grounds that the matter should be deliberated by the Constitutional Congress already called for. With the Constitutional Congress elected, Representative Siqueira Campos presented Constitutional Amendment 2S0001 9, at the outset of the State Organization Commission, with a provision for the creation of Tocantins State and the election of its Governor and Deputy. In August 1987 a petition, signed by more than 70,000 voters, was sent to the House Whip, stressing society's demand for emancipation. 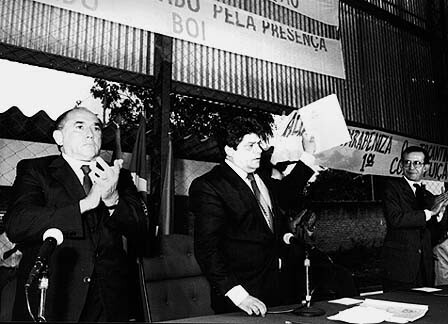 At last, after a persuasion effort with leaders of all parties, Tocantins State was created on July 27th 1988, with the unification of Amendment n°2P00002-9 and the Popular Petition, reestablishing the provision for direct elections. 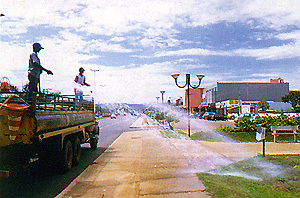 Tocantins State was instituted by Article 13 of the Transitory Dispositions of the new Constitution, promulgated in October 5th 1988, and was inaugurated by its first elected Governor, José Wilson Siqueira Campos in January 1st 1989, in Miracema do Tocantins, chosen as the temporary Capital. On January 1st 1990, the seat of the State Government was definitely established in Palmas, the new Capital. Why on earth does one start a state capital on the wrong side of the river, far from the highway Brasilia-Belem? And why is it called Palmas? The founder of Palmas, Mr. Siqueira Campos, left us with some mysteries, although we think we know some answers. What we do know for sure is that his favorite flower is the sunflower. This has become the symbol for Palmas, and is showing up everywhere. The area where Palmas was build, was originaly used by several farms. Before 1990 the only village on that location was Vila Canela, near the river Tocantins, and near the Graciosa beach. This village and the beach are since 2002 on the bottom of the new lake. The flat area of Palmas is right between the river and the Serra do Lajeado hills in the east, and the vegetation is the typical 'cerrado'. In 1989 Miracema was the temporary capital of the state. One of the first drawings of the new capital by the architects Luiz Fernando Cruvinel Teixeira e Walfredo de Oliveira Filho. On top the Lajeado hills, at the bottom the beach. 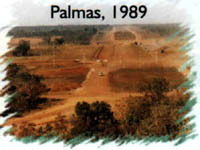 As from 20 May 1989 some roads and baracas where build and in 1990 the government could start creating to its dreams from a new location: Palmas. Mr. Campos decided he wanted to start a city with a complete new infrastructure, based on the experience of other new cities in Brasil. Therefore a new area was looked after. It was decided to take the east side of the river, so the forgotten east side of the state would develop as well. You will often read the location was chosen because it is the geodesic center of Brasil. At the time before the lake, the river Tocantins made some curves, forming the letter S, looking from above. It is said that mister Siquera Campos liked the S, and that added to the choice of the location for Palmas. When the area was chosen in January 1989, Campos decided he wanted the Palacio, the state headquarter, to be build on the highest place in Palmas. Although the architects said the hill is to soft to build on, it was build. The temporary Palacinho, said to be the first building in Palmas, still exists not far from the new one. It is kept as a monument, and since 2002 used as a museum of Tocantins history. Both build on a small hill. The name of the city stays unclear to us. Officially the name is chosen to honour the strive for independency and originates from the village São João da Palma, where Teotonio Segurado presented in 1821 his manifest for independency of the north of Goias. In the early nineties when my wife and I arrived in Palmas, it was night. We saw in the dark that we arrived in a pioneer village that reminded us of ´wild west´ movies. The bus stopped at the Palmas bus station (at that time still at the Avenida Teutonio Segurado). Unlike normal Brazilian bus stations there was a market place with many small shops and the area was completely alive at night. Tired of the long trip, two o'clock, we only wanted to sleep. Not knowing Palmas and in the middle of the night, a bench seemed the best available option. But because of the luggage we had to take care of, and sleeping with one eye open, our first night in Palmas was not comfortable. The next day we contacted a relative at six in the morning, and he decided to show us Palmas. Like everybody in Palmas does, he advised us to stay and see how to invest in the fast growing city. When the day came we saw a strange fenomenon. The air was like a fog, filled with powderdust. Because of all the machines that prepared an enormous area for building activities, the erosion filled the wide region with powder. We started to feel more and more uncomfortable. A real estate agent was willing to show us some areas to buy. We drove for half an hour through the bush. He suddenly stopped and pointed at some shrubs. For sale, 360m2. ´Only´ 3000 dollars. We hurried to leave Palmas. Many years later we returned, the air was cleared a lot, and we liked the city much better and eventually invested. We learned that the agent must have been very untrustworthy. But meanwile all the areas sold by the government were sold out and the prices had gone up and were indeed 3000 dollars now. At the moment Palmas is a very busy city and the goverment is working hard to make it a green and modern city. You will find many people that moved from big cities to Palmas, just for the reason it is very save. The major tries very hard to prevent that quarters with criminality develop. Also social programs must prevent poverty. Furthermore: because there are only few ways in and out the city, all cars can be checked. Nevertheless, everybody parks his car inside at night and most houses have a wall around. All roads are kept green with grass, flowers and palmtrees. This is done by boys who are paid with a little money, food to bring home to the family, and education. One of the modern ideas of Palmas. Talking of roads: arriving in Palmas you notice that all main crossings are roundabouts. This minimizes the number of traffic lights and indeed you can cross the city very fast. Be careful as they now started to control speed limits. Not yet been in Palmas? If you have no special reason to go to Palmas: don't go there. If you have friends there, you will certainly enjoy your stay. It is almost a grown up city and it will offer you some shopping centers to cool off, cheap restaurants, nice bars were you can enjoy the life music and dance, and nightclubs. The lake of the Lajeado Hydroelectric Power Plant offers many possibilities for water entertainment. Graciosa beach: for 10 years this beach was the bathing place for the people of Palmas and many events were organized on this beach. Famous Brazilian popstars have been here. 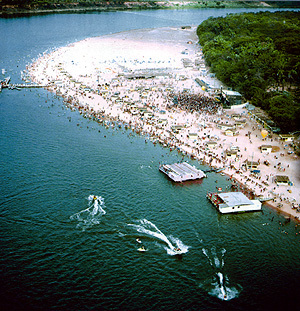 The beach has made place for the big lake with bars, restaurants and events all year round. The name Graciosa is still used: today it is the name of the beach south of the bridge.